Deep rooted, short-lived perennial, having finer stems and more leaves than alfalfa. 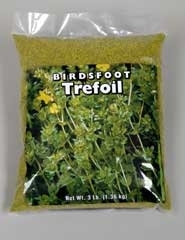 Grows 12 to 30 inches tall, depending on whether it is a prostrate or erect variety. 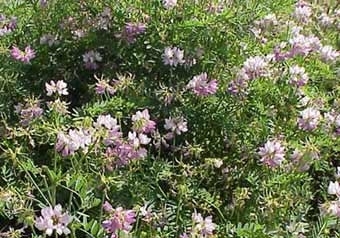 Crown vetch, a member of the pea family, is a perennial herb with creeping stems that may reach two to six feet in length. 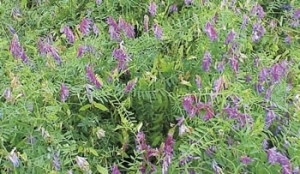 Both Purple Bounty and Purple Prosperity are winterhardy, earlier maturing hairy vetch varieties developed for high nitrogen fixation (up to half of a subsequent crop's nitrogen), increased biomass for a thicker mulch and earlier flowering for more flexibility in planting succeeding crops.